1. 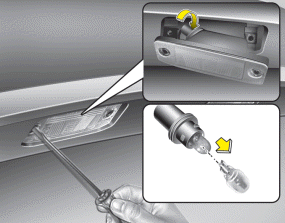 Loosen the retaining screws with a philips head screwdriver. 2. Remove the soket by turning it connterclockwise. 3. Remove the bulb by pulling it straight out. 4. Install a new bulb. 5. Reinstall the bulb assembly securely with the retaining screws.